Standard USGS procedure is to filter inorganic-constituent wholewater samples through a 0.45-micrometer (μm) pore-size disposable capsule filter. The capsule filter is a disposable, self-contained unit composed of a pleated filter medium encased in a plastic housing that can be connected in-line to a sample-delivery system (such as a submersible or peristaltic pump) that generates sufficient pressure (positive or negative) to force water through the filter. Filter media are available in several other pore sizes, but 0.45 mm is the pore size used routinely for most studies at this time. The capsule filter is required for most studies when filtering samples for trace element analysis and is recommended when filtering samples for major-ion or other inorganic-constituent analyses. The Geotech Versapor® dispos-a-filter™ is a disposable filter capsule designed to perform in-line water filtration in the field. Our filters have a narrow pore distribution and high void volume which allows excellent liquid flow rates at low differential pressures. The dispos-a-filter™ readily fits on ¼" (.635 cm) to ½" (1.3 cm) sized sample tubing with a specially designed sample tubing adapter. The Geotech PES (Polyethersulfone) dispos-a-filter™ is the easiest and most cost efficient way to prepare water samples for trace metals analysis. 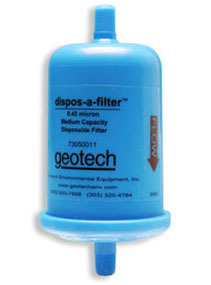 Geotech's dispos-a-filter™ capsules feature self-contained absolute rated pore size membranes that are scientifically designed to meet U.S. EPA filtration regulations. When field or laboratory filtration is required, the dispos-a-filter™ is perfect for maximum flow capacity and retention of particulate matter. The Geotech PP (Polypropylene) dispos-a-filter™ is the easiest and most cost efficient way to prepare water samples for trace metals analysis. 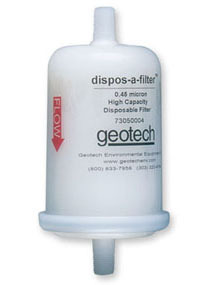 Geotech's dispos-a-filter™ capsules feature self-contained absolute rated pore size membranes that are scientifically designed to meet U.S. EPA filtration regulations. When field or laboratory filtration is required, the dispos-a-filter™ is perfect for maximum flow capacity and retention of particulate matter.